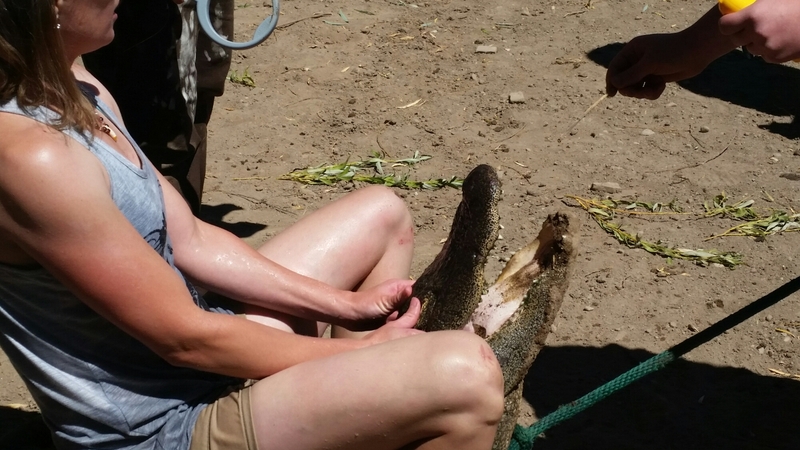 Had the privilege this weekend of tagging along with a friend to an Alligator Rodeo in Southern Colorado. Wranglers wade out into an alligator pond until they bump into one underwater, toe around and feel where its legs are, then hop on its back, lasso it around the neck, and drag it ashore. Points are given for speed and length of the alligator. I was an observer and data recorder, NOT an actual participant. I’d like to stress that. I’m well aware that I’m not the kind of person who should be dancing with danger so closely. I know this. It is pretty awesome to watch others do it, though. A local vet tech scans the gators for tags, and if they are new (untagged) they get a tag and a name. I have an alligator named after me after this weekend. If there are any injuries (apparently alligators’ hobbies include beating the crap out of one another) they are treated and then sent back into their habitat. I got to see a toe amputation- that was gruesome. Sometimes I wonder if rednecks aren’t having the most fun of us all. After a day of mud and gators, we went to a local hot spring to relax and then drank some wine by a fire and enjoyed watching the stars. I slept in the bed of a truck. In the morning we pointed an old iron cannon at watermelons (firing gumballs) until we actually blew up the cannon and were forced to contemplate our own mortality. Funny, how gratifying terror can be sometimes. On the drive home we stopped and explored an old ghost town. Fun times.